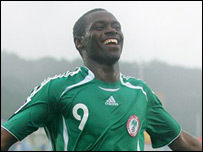 English side Chelsea and Spanish giants Real Madrid are among those battling it out for the signature of Nigeria youth international striker Macauley Chrisantus. The 17-year-old finished as top-scorer at the Under-17 World Cup which ended in South Korea last week. But the two clubs face stiff competition from a number of other top European sides who are also interested in the lanky striker. His agent Adam Mohammed confirmed that Liverpool, Ajax, Arsenal and Marseille are among the many clubs interested in Chrisantus. Mohammed told BBC Sport: "We have received at least 12 very serious offers from some of the top clubs in Europe like Chelsea, Arsenal and Liverpool for Chrisantus." "There are other clubs like Ajax and Hamburg who have even presented a comprehensive plan on how to turn my player into a world-class striker. "There are huge financial deals offered from eastern European countries too as well but we want to take our time and look for a club where he can develop and play regular competitive football." There are concerns that if the striker signs for an English club the granting of a work permit could pose problems, as Chrisantus is yet to play for the Super Eagles. Immigration laws in Britain require players from outside the European Union to have played in at least 75% of their country's senior international games over the two-year period preceding a work permit application. But Mohammed says the English clubs are still in the picture as the striker is deemed an exceptional talent and could be adjudged as a special case. "The English clubs cannot be ruled out because there is a provision in the British work permit regulations that allows a special talent to be considered. "Some of the English clubs we have spoken to have assured us that they will apply for a work permit for him under this clause to enable him play in England. "By next week we should be getting a clear picture of which club will sign Chrisantus."